EggTimer 2 is a major advancement of my previous EggTimer extension (for Alfred 1), built to take advantage of Alfred 2's great new features. 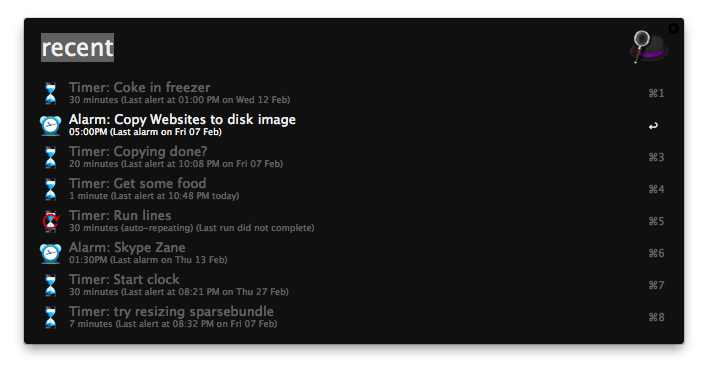 NOTE: Many have discovered problems with this workflow not showing recent timers etc., especially after an OS upgrade. This is to do with the permissions settings of the workflow's working folders. Simplest thing to do to remedy it is just to run "timer nuke" once which will reset the workflow to a fresh install. You can use EggTimer for something as simple as reminding you when your favourite TV show is about to start, to automatically prompting you to take breaks every hour. Full documentation is included in the workflow. Just run timer help in Alfred. Multiple simultaneous timers and/or alarms. Automatically repeating timers (e.g. Take a break every 90 minutes). Repeating alarms (Notify me at a certain time every day). Repeat/relaunch the last timer or alarm. History of recent timers for quick re-use. Timers automatically resume after a computer crash or restart.